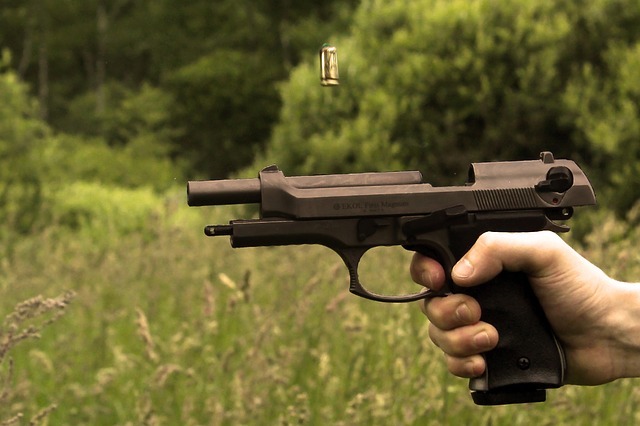 Modern technology in the field of forensic audio analysis makes it possible for an audio forensic expert to be able to recognize a firearm, sometimes by just listening to the sound of firing. Trained audio forensic experts recognize the different type of firearms, the different barrel lengths, types and weights of ammunition, that result in varying bullet speeds and totally different Sound Pressure Levels (SPL) or audio signals. In this post we will share insights to the Sound Pressure Levels (SPL) and Bullet Speed of highly used Revolvers (.357 Magnum and .38 Revolver), 9 mm Pistol and Rifles (.30-.60 Rifle and .223 Rifle) along with bullets like Winchester Silver Tip Hollow Point, Winchester Full Metal Jacket, Winchester Soft Point and Hollow point. A Smith & Wesson .357 Magnum Revolver (Model 13) with a 3 inch barrel, when fires a Winchester Silver Tip Hollow Point bullet weighing 9.4 grams will result in a bullet speed of 362.4 meters per second and a Sound Pressure Level (SPL) of 155.4 decibels (when recorded at 1 meter and at an angle of 90 degrees). However when the same revolver fires a Remington Jacketed Hollow Point bullet weighing 8.1 grams results in a bullet speed of 427 meters per second and a SPL of 158.5 decibels. A Winchester Silver Tip Hollow Point bullet weighing 7.1 grams when fired with a .38 Smith & Wesson Revolver (Model 10) having a barrel of 2.5 inches, will result in a bullet speed of 269.7 meters per second and a SPL of 153 decibels. The same bullet when fired with 4.0 inches barrel will produce a bullet speed of 287.1 meters per second and a SPL of 151.4 decibels. A .38 Smith & Wesson revolver (Model 60) when fires a Winchester Silver Tip Hollow Point bullet weighing 7.1 grams, with a 2.5 inch barrel will result in a bullet speed of 250.2 meters per second and Sound Pressure Level of 155.4 decibels. When a Winchester Soft Point bullet weighing 8.1 grams is fired with a .30-06 Rifle of Winchester 70 make and barrel 22 inches, the result is bullet speed of 889.1 meters per second and 160.8 decibels of SPL. When the same rifle fires the same bullet having a weight of 10.7 grams the resulting bullet speed is 827.5 meters per second and 160.1 decibels SPL. The last firearm we have covered is a .223 Rifle of Colt M16A1 make having a barrel of 21 inches, when fires a Winchester Hollow point bullet weighing 4.1 grams, will result in a bullet speed of 803.8 meters per second and SPL of 156 decibels.Post forensic enhancement, when we use professional Forensic Audio Analysis skills and combine it with this type of accurate statistics we can decipher many insights like the type of bullet fired, the exact location of gunshot and the type of firearm used. These insights help us in solving many crimes and reconstructing crime scenes with high precision accuracy.